City of Wanneroo Mayor Tracey Roberts congratulated scholarship recipients Anna Anagno, Lorna Spear and Tom Young, and wished them well in the Ignition Program. “We had planned to offer two scholarships, but the calibre of applicants was so terrific that we could not stop at two,” Mayor Roberts said. “This is evidence of the great businesses we have in the City of Wanneroo and I encourage residents to buy in their own backyard in support our local economy. “We recognise the vital role local businesses play in our community – providing local employment opportunities, servicing our growing residential population, building our economy and creating strong and vibrant centres. “The City is funding the scholarship places to provide opportunities for existing and new start-up business owners to develop their skills, networks and ideas while learning from business experts all critical for the ongoing growth and success of our region. The scholarships, offered in partnership with Curtin University, provide full funding to undertake the Curtin Ignition Program in September – an intensive education program for aspiring entrepreneurs, academics and corporate innovators to trial and prepare their business ideas for the commercial environment. 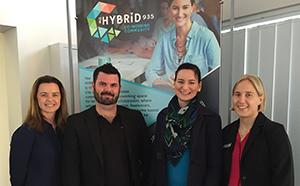 The scholarships also include a six month membership to the Wanneroo Business Association, space to work at the Hybrid 935 co-working community eight hours a week for six months and access to local business support services. Based in Hocking Anna is an environmental scientist with a passion for living sustainably. She created her eco-friendly and sustainable jewellery business to reflect this passion and her designs are inspired by nature using quality eco-friendly bamboo with her signature sophisticated, simple style. Lorna’s business idea stemmed from a desire to change the look of the metal bull-nosed door frames in her own home. The Butler resident created an eye-catching solution to this problem without having to rip out the existing metal door frame, which would cause a lot of damage and require some renovation. After making a number of designs and prototypes em.el decorative architrave was created. Tom has been in the design, construction, project management, software and engineering industries for over 16 years. He has always had a passion for increasing efficiency and systems in the workplace and applying advances in technology for continuous improvement. Tom has an innovative idea that he would like to develop in the City of Wanneroo and is undertaking the Curtin Ignition program in order to prepare his idea for the commercial environment. PHOTO CAPTION: L-R Danelle Cross, Curtin University Ignition Program, Tom Young, New Business Start-Up, Anna Anagno, One Happy Leaf, Nyssa Searles, City of Wanneroo.